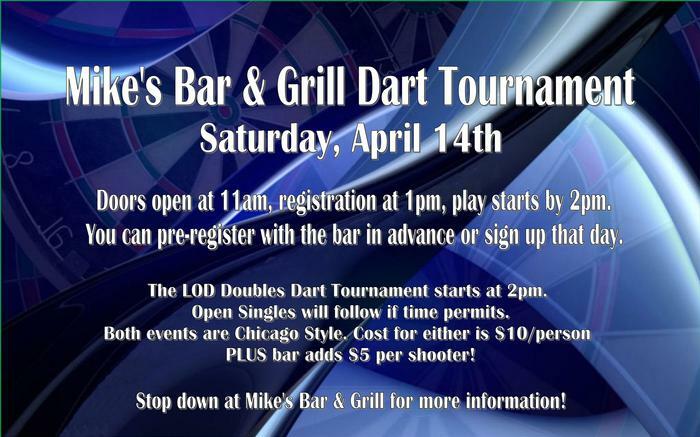 Mike's Bar & Grill Luck of the Draw Doubles Dart Tournament and Open Singles Dart Tournament will be Saturday, April 14th. Doors open at 11am, registration at 1pm, play starts by 2pm. You can pre-register with the bar in advance or sign up that day. 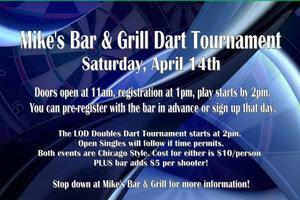 The LOD Doubles Dart Tournament starts at 2pm, Open Singles will follow the tournament if time permits. Both events are Chicago Style. Cost for either is $10 per person PLUS the bar is adding $5 per person!